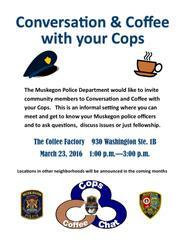 The Muskegon Police Department would like to invite community members to Conversation and Coffee with Your Cops. This is an informal setting where you can meet and get to know your Muskegon police officers and to ask questions, discuss issues or just fellowship. This Conversation and Coffee with Your Cops event will be held at The Coffee Factory located at 930 Washington Avenue, Suite 1B inside the Watermark Lofts from 1p.m. to 3p.m. on Wednesday, March 23. While this is open to the general public we are particularly targeting those neighborhoods in that immediate area and plan to have those respective officers present. In the coming months these events will be held in various locations throughout the City of Muskegon so that residents from throughout the city can participate. Please look for further announcements.